Using Siri couldn’t be easier with macOS Sierra: You summon it, ask or tell it to do something, and then wait for that something to be done. But there are several tweaks you can invoke that can help make Siri sound and behave the way you prefer. You manage Siri in its System Preferences pane ( → System Preferences → Siri). The Siri System Preferences pane offers these options for customization. Language menu: Use this menu to select the language Siri will speak and understand from a long list — including nine varieties of English; four varieties each of Chinese, French, and Spanish; and dozens of others. Siri is known to have difficulty understanding people with distinct accents. If it has trouble understanding you, look in the Languages menu for a different version of the language. It couldn’t hurt, and it might just help. Siri Voice menu: Lets you select the gender and nationality of your Siri. You can choose American (male or female), Australian (female or male), British (male or female), or Irish or South African (female only). Voice Feedback radio buttons: These buttons allow you to enable or disable voice feedback. Do you want to hear Siri’s dulcet tones? Click the On button. Do you prefer Siri keep its mouth shut? If so, click the Off button. Mic Input menu: Lets you specify a microphone other than your Mac’s internal one. Keyboard Shortcut menu: If you don’t care for the default ⌘+spacebar keyboard shortcut, this menu lets you change it to anything you like. Show Siri in Menu Bar check box: This option does what you’d expect — it allows you to disable Siri’s menu bar icon, which is enabled by default. And that’s pretty much all you need to know to use and customize Siri in Sierra. Siri requires an active Internet connection. If you aren’t connected to the Internet, you can’t use Siri. Siri is not great at recognizing your words when your environment is noisy. 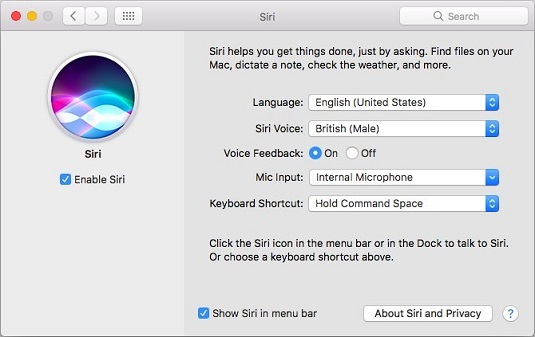 If Siri misunderstands you frequently and changing languages didn’t help, try moving your face closer to your Mac and speaking in the direction of its microphone. Or try using an external microphone, which will almost certainly help.